A man watches a baseball game in the sports book at the South Point hotel-casino, Monday, May 14, 2018, in Las Vegas. The Supreme Court on Monday gave its go-ahead for states to allow gambling on sports across the nation, striking down a federal law that barred betting on football, basketball, baseball and other sports in most states. It’s being called a landmark Supreme Court decision and a historic day for American sports, as the U.S. Supreme Court has ruled that a federal ban on sports gambling is unconstitutional. 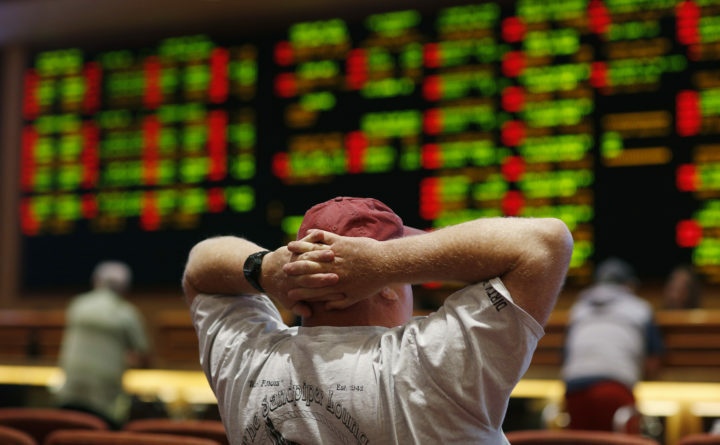 The ruling paves the way for states to legalize sports betting. But unlike dozens of other states that anticipated Monday’s ruling, Maine will be playing catch up if it wants to get involved in a multibillion-dollar sports gambling business. The Supreme Court ruling overturned a 1992 federal law that blocked most states from legalizing betting on everything from the outcome of Tuesday’s Game 2 playoff matchup between NBA’s Boston Celtics and Cleveland Cavaliers, to New England Patriots quarterback Tom Brady’s next touchdown pass. But that doesn’t mean those wagers aren’t already happening. Estimates from the American Gaming Association peg underground sports betting as a $150 million industry, and some consider that a very conservative estimate. Now, the same association says legalized sports betting could be worth over $41 billion in revenue to the states that choose to allow it. “There’s roughly about 30-35 states that are in the queue with either laws and or rulemaking,” says Maine Gambling Control Board director Milton Champion. Champion says the states that anticipated the court ruling have set up regulations that will allow them to tap into a legal sports betting industry and the tax revenue expected to flow from it. Champion says states that already allow slots or table gaming are among those that might be most receptive to allowing sports betting. Such states would include Maine, which has casinos in Oxford and Bangor that already generate roughly $50 million in annual tax revenue to the state. But Maine does not have rules in place to take advantage of Monday’s court ruling. “Not at this point. I have not heard anything, have not been requested for information or anything of that nature. Right now I guess it’s just wait and see,” Champion says. “I think a lot of work is going to have to go into this in the months that follow,” says state Rep. Louis Luchini, co-chairman of the Legislature’s Veterans and Legal Affairs Committee, the panel that writes and reviews gambling legislation. Luchini expects a wave of bills next session that attempt to legalize sports gambling in Maine. And that’s the first step: The Supreme Court’s ruling doesn’t automatically allow sports gambling — it lifts a federal prohibition that barred states from allowing it. Luchini says efforts to legalize sports gambling in Maine would draw a lot of interest, and likely some aggressive competition. “I think with any talk of expanded gaming, it’s always a fight between who would be able to do it and who can’t. So we will see all these people either working together to get it legalized or to team up to get exclusive rights,” he says. Such a proposal could also pit existing gambling operators against new arrivals. In Maine, that could mean Oxford Casino and Hollywood Slots vying for exclusive rights to sports gaming versus newcomers like FanDuel or DraftKings — two companies that have profited from the explosion in fantasy sports. FanDuel and DraftKings have lobbied state legislatures, including Maine, to create rules that effectively exempt them from the federal law that the Supreme Court just overturned. They argued that fantasy sports isn’t gambling because there’s an element of skill involved. Shortly after Monday’s court ruling, both companies announced they’re launching an online sports betting platform. The companies are expected to apply for licenses in other states that passed laws legalizing sports betting. While Maine isn’t among those states, it could be the stage for a lobbying battle between existing gambling operators with Las Vegas parent companies and online insurgents that already boast over 14 million users.